As many of you may already know, Michigan is now among a growing list of states experiencing measles outbreaks, with state health officials confirming 21 cases so far in Oakland County and one in Wayne County since March 13. In an effort to keep you and your family healthy we offer the following information and resources. We hope this is helpful and that your family is staying well! – If you have NO concern that you have been exposed to the Measles virus, we will check your immunity status by testing your blood at your next obstetric visit. You may also call the office and have a blood draw visit scheduled sooner, if you desire. -If you ARE concerned that you have been exposed to the Measles virus, please, call the office and leave a message for one of our obstetricians. We will call you within 24 hours to help facilitate your care. 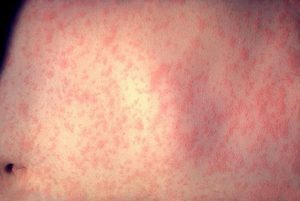 Measles is transmitted by direct contact with infectious droplets or by airborne spread when an infected person breathes, coughs, or sneezes. Measles virus can remain infectious in the air for up to two hours after an infected person leaves an area. How do I know if I am immune? Should I or my family members get the vaccination? Children: CDC recommends routine childhood immunization for MMR vaccine starting with the first dose at 12 through 15 months of age, and the second dose at 4 through 6 years of age or at least 28 days following the first dose. Students at post-high school educational institutions: Students at post-high school educational institutions without evidence of measles immunity need two doses of MMR vaccine, with the second dose administered no earlier than 28 days after the first dose.